1) The Highlight Reel - Having spent the majority of my adventure riding career in Patagonia, I'm certain that this route is the absolute best way a dual sport-capable Rider can spend such a trip duration. Sure, there are other things to see, but again, more would take more time (so for that, ask us about a Private Group Tour.) "What about riding further each day?" 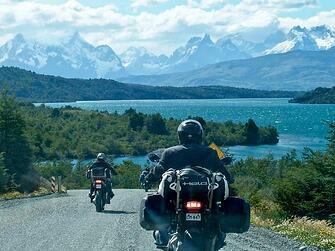 Sure, some Riders can cover more ground in the same number of days, but Patagonia shouldn't just be about riding. 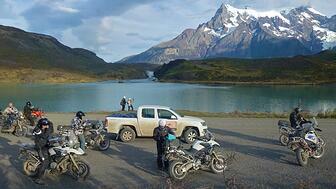 Patagonia isn't a place to hurry through without truly taking-in the silence, the beauty, the remoteness. There will be so many little side experience off the bike to be enjoyed, please trust us ... this is the right pace for such a trip. This itinerary makes for a very full schedule, and you will not be bored. 2) Trip Format - "Self Guided, Truck Supported" - Should speak for itself pretty clearly. Those of you who don't like the feeling of being obligated to ride behind a Lead Guide, or don't necessarily want to be always amongst the same group of Riders will find this the perfect format for remote territories like Patagonia and Tierra del Fuego. Our Customers still do this trip without the Support Truck (purely Self-Guided,) but having a) your luggage in the truck, instead of on your bike and b) the safety and reassurance of our Bi-Lingual Guide/Mechanic there with you can be a major benefit, if any of the many possible scenarios of adventure riding arise. Remember, in addition to this Support Truck, your motorcycle rental and hotel package are all included! 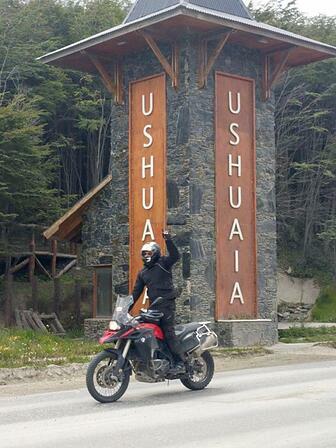 3) Seasonality & Climate - Being so far south on our planet, even further south than Cape Town and Melbourne means we have a short season of October through April to ride in Patagonia. (REMEMBER: Northern and Southern hemispheres have opposite seasons and riding summers.) With January and February being the "middle" of summer then, those are our busiest months with the best weather. While Patagonia trips typically have plenty of nice, comfortable weather, even mid-summer on a route like this, Riders will have plenty of time spent in cold temperatures, and possible rain. "Yuck?" No way. The grit. The challenge. The variety ... all are part of what make this one of the all-time greatest adventure rides ever. 5) Experience Needed - Along with having experience both on and off pavement riding, as mentioned earlier, a Rider also needs to be prepared for a wide variety of climatic conditions. While we'll complete this trip sometimes without a drop of rain, occasionally groups have seen "some" rain on as many as half of the days of the trip. 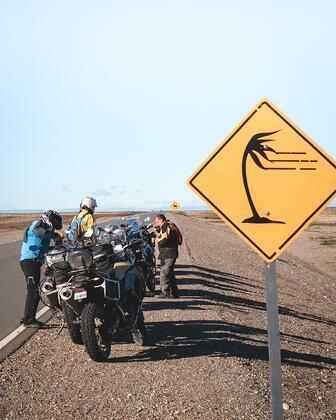 Many travelers have reported about the fierce winds of Patagonia as well, and yes, they can be quite severe often over 50mph. PLEASE THOUGH, don't let that scare you away. First, those "possibly windy" sections are really only found on 2-3 sections of the entire route, and even on those, the wind could remain calm all day. Secondly, it's just wind. It just means you have to slow down a bit more, and not blast down the Ruta 40 in Argentina at the pace you might otherwise. It also means you'll take a few more rest breaks and lean into the wind for fun like shown in the video above. 6) Want to Reserve Your Spot? - Excellent if so, but even still, we want to have a conversation with you first and share some more details about the route. This is not a "click and buy" type of a travel experience, and so we don't allow such on our site yet. This Self-Guided, Truck Supported Full Patagonia Adventure package is something you'll want to have booked a year ahead of time as possible, as Patagonia is very popular for us and bikes/dates can sell out over 8+ months in advance. One booked, get ready for an adventure like no other. I promise, this is a riding & exploration experience that you will never, ever forget.